This latest leading-edge system was purchased to strengthen Reliance’s surface analysis and measurement capabilities in its Metrology department. Typically, Reliance’s Metrology & Inspection team had undertaken surface analysis testing using the traditional contacting stylus method. However, the physical touching of the stylus on the part being tested risked the surface becoming damaged in the process. As a consequence, for a number of key projects, where non-contact measurement was required, a rigorous visual inspection had to be undertaken. Recognising the limitations of this process, Reliance identified the need to investigate technologies that would enable them to accurately and effectively evaluate the texture of delicate parts and obtain visual representations to help evaluate any process defects. After researching the market, the SmartProof 5 system from Zeiss was the system that stood out. As well as being highly efficient, highly accurate and easy to use, it was one of the few systems designed for use in a manufacturing production environment rather than a laboratory testing area. 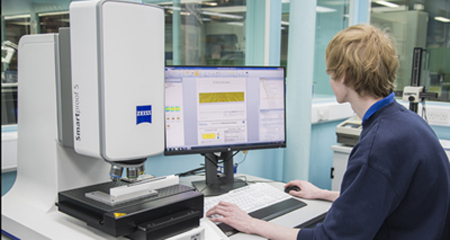 Zeiss, recognising the learning they could gain from having their system installed in such a highly accurate manufacturing environment, testing a wide range of complex parts, proposed a collaborative purchasing agreement whereby Reliance provide monthly feedback on their use of the system. The experience and expertise provided by Reliance helping Zeiss in the future development of the system. The SmartProof 5 system has enabled Reliance to characterise and quantify any process defects on critical surfaces, not just on existing projects, but also on new development work. The system enables Reliance to scan the surface optically (leaving no measurement marks) and evaluate the surface against required specifications. The software has allowed them to create templates to perform the analysis, almost fully automated, applying tolerances and providing 3D topographies for visual analysis. In the context of Reliance measuring defects that are at a scale of 0.5µm to 3µm (microns) in depth, they believe the integration of the system in the manufacturing process will see a reduction in the rework of parts and a further improvement in the quality of the product, meaning Reliance’s customers can be reassured of the high precision nature of the parts they are purchasing.